The 70th Republic Day was celebrated with patriotic fervour urging the citizens to work forpeace, harmony and progress. Ms.Varsha Khamgaonkar, Faculty, Senior School hoisted the tricolour followed by the national anthem which is a perfect tribute to our motherland. Dr. Shoeb Adil, Head of Social Science Department, Senior School spoke eloquently about our diverse nation and the unique Constitution. Inspirational speeches were delivered by the students from the Junior and the Senior school.The Dance Drama showcasing the glorious history of India based on the Queen of Jhansi made all bow in allegiance to the freedom fighters who laid their lives for the motherland. The programme comprising of melodious patriotic songs by the vibrant school choir, movements of mime act and the enthralling orchestra marked the occasion. A combination of multiple emotions in centripetalmotion involving glimmer, glamour and glitz was witnessed when Choithramfraternity gathered to bidadios to the outgoing batch of class XII on January 26, 2019 in a grand farewell ceremony. The programme commenced with the divine Ganesh Vandana followed by felicitation of class XII with the titles and me mentoes. A spate of dance, music and laughter enthralled the gathering along with the unforgettable moments knitted in the power point presentation. The musical skit and hilarious advertisement of ‘Choithram Tonic’ enthralled the audience while the melodious band performance added flavour to the event. Students of class XI poured their sweat and soul to make the event memorable.Mr. Nandan Tonpay, parent of Atharva Tonpay of class XII expressed gratitude to the school for the holistic development of children while the school mentor Ms. Sangeeta Thander in her speech guided the students to focus on their goal to achieve success in future. Akkshat Dutta, School Head Boy and Rishita Sethi, School Head Girl thankedthe teachers for grooming students with skills and style to face the challenging world. Principal Mr. Rajesh Awasthi stressed on to become the real performers in life. Mr. Choithram was bagged by AtharvaTonpayand Ms.Choithramby Rishita Sethi while Atharva Dave and Dinsha Ahuja were chosen as Mr. and Ms. Elegant respectively. Children’s Day was celebrated with gusto on November 14, 2018 by the mentors of Choithram School. In the Senior School the day commenced with thespecial assembly wherein the teachers conducted the assembly from singing the prayer to presenting the thought and speech for the day. The teachers reminisced about their childhood innocence and curiosity through their presentations. The programme comprising of skits, songs, fusion dance and standup comedy received a huge applause from the students thus cementing the bond between teachers and students. The game show by the teachers witnessed the excitement and enthusiasm of students at its peak as it was based on identification of costumes and people. The anchoring script displayed rhyme and rhythm and added flavour to the presentation. The programme concluded with the orchestra followed by the vote of thanks by the council members. A colourful celebration was witnessed on the occasion of Teachers’ Day on September 5, 2018 at Choithram School. Garlanding of Dr.Sarvapalli Radhakrishnan’s portrait by the School Head Girl, Rishita Sethi and the School Head Boy, Akkshat Dutta followed by speech about the history of the day and Dr.Radhakrishnan’s contribution marked the beginning of the programme. Student teachers stepped into teachers’ shoes to take care of the students. The student council presented various acts and performances making their mentors know how they help in setting the building blocks required for life beyond academia. Dance performances by zealous students, skit, melodious musical notes performance and games for teachers were entertaining and enjoyed by everyone. Portrait of individual teacher along with the title was given as a token of remembrance by the students. The programme was an ode to teachers who inspire, encourage and play a role model for the students during their schooling years. ‘Freedom in the mind, faith in the words, pride in our souls’, this dictum floated across the campus on the occasion of 72nd Independence Day celebration. Vice Principal Mr. S.K. Mishra hoisted the tricolouras the national anthem reverberated filling every heart with love for the country. Students marked the day with special performances including inspirational speeches, mesmerising dance performances and patriotic songs paying homage to the freedom fighters and unsung heroes whose sacrifices make the Indians breathe in free air. School Principal Mr. Rajesh Awasthi urged all the students to contribute in making India a haven to live in. A wave of joy gripped the hearts of children and parents alike as Choithram School observed the Graduation Ceremony of yet another batch of young students who had arrived the threshold of the school three years ago with several apprehensions. However, there was a sense of general anxiety among the children and their parents as they stood at another crossroad of their life but then were ready with zeal and enthusiasm to move ahead. This movement was given by them through their graduation ceremony which was a blend of Indian values, emotions, festivities and cultural extravaganza. The day concluded with mixed emotions of happiness and despair as the children parted ways with their teachers and friends who had been with them all along the way. The 69th Republic Day was celebrated at Choithram School Manik Bagh with hearts full of pride for the nation and head held high for the glorious past, magnanimous present and a bright future. The National Flag was hoisted by Mrs. Bharatee Pandey, Maths teacher of the Senior School. The gathering witnessed patriotic dance performances, songs and kavi sammelan. Charvi Gangwani of class IX and Ms. Meghna Kaitwade of Science Department, Senior School in their speeches highlighted that freedom is not free; it comes with responsibilities and duties. Farewell, a culmination of a beautiful school journey was accorded to the outgoing batch of class 12 students on January 26, 2018 at Choithram School, Manik Bagh. The programme attended by parents of class 12 students commenced with ‘Vandana’ followed by an extravaganza of dance and musical performances, skit, street play and messages of love. Dr. S. C. Sharma, Principal, Acropolis Institute of Technology and Research, Indore and proud father of Dikshant Sharma of class 12 addressed the gathering and appreciated the school for making the kids responsible individuals. Principal Mr. Rajesh Awasthi in his didactic speech asked the students to uphold the values learnt in school. The words of gratitude expressed by the Head Boy Jay Sharma and Head Girl Aastha Vijaywargiya touched the hearts. The award for Mr. Choithram was shared between Pawan Wadhwani and Chaitanya Vyas while Miss Choithram title was bagged by Chelsea Sawlani. Ishan Paliwal and Aastha Vijawargiya were felicitated with Mr. and Miss Elegant titles. Teacher’s’ Day celebration on September 5, 2017 in the school campus reached a new apex this year with a rejuvenating cultural show. The celebration commenced with the garlanding of Dr. S. Radhakrishnan’s portrait followed by ceremonial lamp lighting by School Principal Mr. Rajesh Awasthi, School Head Girl AasthaVijayawargiya and School Head Boy Jay Sharma. The student teachers taught in the classes gaining the experience of the noble profession. The cultural fiesta comprising of dances, melodious songs, rocking band, hilarious Ad Mad show, soul stirring poem and a special video expressing the place of a teacher in a student’s life won the hearts of the teachers. Musical performance by one year exchange students Marta Imeneo of Italy and Hannah Ochterbeck of the USA was appreciated by one and all. The game show tested the mentors’ intellect, observations and of course their Bollywood love. Chelsea Sawlani bagged the position in ‘Envision-Debate’ while Nandini Bhachawat won third prize in ‘League of Nations-Group Discussion’. The scuplting skills of Anshika Bhargava and Aastha Vijaywargiya won commendation award. One year exchange students of the school, Martha Imeneo of Italy and Hannah Ochterbeck from the USA visited the competition as observers. Principal Mr. Rajesh Awasthi appreciated the achievements of the students at the international level and congratulated the team and mentors for their laudable performance. The Independence Day of India was celebrated with patriotic fervor in the school on August15, 2017. The tricolor was unfurled by Ms. Raji Pillai, Coordinator Activities Junior School. An array of performances including melodious songs, vibrant dances, rhapsody by the orchestra and well synchronized yoga display surcharged the atmosphere with patriotic spirit. The speech by Kavya Shah, Cultural Prefect focused on women empowerment while Ms. Mita Pandit, Hindi faculty, Junior School stressed on our duties and responsibilities as productive citizens to sustain independence in a true sense. The celebration ended with the rendition of National Anthem. Graduation ceremony of Senior Montessori students was organized in the school on March 27, 2017. The programme commenced with welcome dance presented by the students of Junior Montessori. The students of Senior Montessori presented vibrant dance performances and were graduated to move ahead for their formal education. Principal Mr. Rajesh Awasthi presided over the function. The 68th Republic Day of India was celebrated with great zeal and patriotism on January 26, 2017. Ms. Raminder Mac, Dean International Affairs, hoisted the tricolour. The programme comprising of melodious patriotic songs, scintillating dances, kavi sammelan showcasing glorious history of India, enthralling band performance and inspirational speeches marked the occasion. The celebration ended with the national anthem. The whole ambience witnessed a combination of multiple emotions in centripetal motion involving regalia and exhilaration when the students and staff of Choithram School, Manik Bagh bid good bye to the outgoing batch of class XII on January 26, 2017 in a grand farewell ceremony. The programme commenced with the divine Ganesh Vandana followed by felicitation of class XII with the titles and mementoes. A spate of dance, music and laughter enthralled the gathering along with the unforgettable moments knitted in the video. The skit strengthened the faith in friendship while mime on the theme ‘School Reunion’ made the students relive their memories of school and touched the cords of their heart to the core. Mr. Jay Prakash Chowksey, a renowned columnist and grandfather of Prathma Chowksey of class XII offered his tributes to Choithram group for the holistic development of children and also recited a poem to bless the youngsters. Nutan Keswani, School Head Girl thanked the teachers for grooming students with skills and style to face the challenging world. Principal Mr. Rajesh Awasthi stressed to be original and advised the students not only to focus on destination but to learn ways to reach the destination. Felicitations in the form of awards made the celebration special. Mr. Choithram was bagged by Shashank Singhal and Ms. Choithram by Disha Trivedi while Ashi Malviya and Prasham Pahadiya were chosen as Ms. and Mr. Elegant respectively. 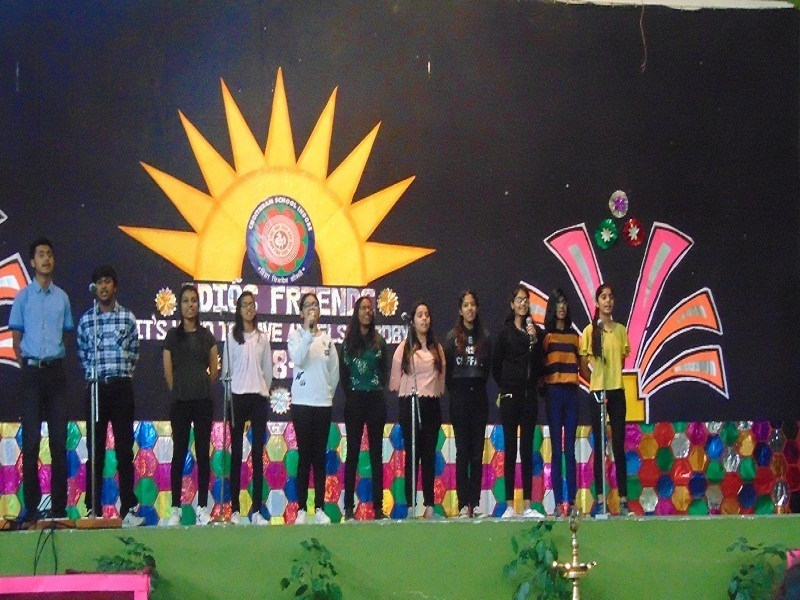 Children’s Day was celebrated in the school with mesmerizing performances by the mentors. Exotic dances, hilarious yet motivational skits, melodious song presentations, artistic performance along with the dance, poem recitation were the highlights of the programme. Choithram School, Manik Bagh team comprising of Nischay Pagarani, Pawan Wadhwani, Chaitanya Vyas and Shashwat Vyas of class XI bagged the overall championship award at the International Robotronics Competition National finale organized by IRC League at Heritage School, Gurugram on December 10, 2016. The competition witnessed the Robotics stalwarts from 120 teams from 60 different schools and 10 different states battling to win the National Championship. Choithram School team has won a sponsored trip to China to represent India in the International Robotronics Competition to be held in China in the month of June 2017. They also won a gift hamper consisting of Pen drive, Power bank and a memento. Principal Mr. Rajesh Awasthi congratulated the team members on their achievement. Earlier the team had secured first position at the city level in the IRC Competition held at G. D. Goenka Public School, Indore. Choithram School, ManikBagh hosted Senior BalVigyan (Physics) under the aegis of Indore Sahodaya Schools Complex on November 10, 2016. The event witnessed the project presentation of 15 CBSE affiliated schools of Indore Sahodaya Schools Complex. The presentations by various schools ignited the scientific and creative minds of the students. The theme of the event was ‘Design A Change For Better Tomorrow’. The event was judged by Dr. Dinesh Varshney, HOD Physics DAVV, Mr. Mohit Dubey, Senior PGT Physics Sri Satya Sai VidhyaVihar and Mr. Vinay Sharma, PGT Physics, Choithram School, ManikBagh. Students presented their innovative projects and faced the question answer round by the judges and the participating schools. Colonel’s Academy, Mhow, Standard Public School, Indore and J. J. Public School won the overall Best Presentation Award. Best presentation award went to The Millennium School, Indore Best idea related to theme was bagged by Queen’s College, Indore while Best Content and Knowledge award went to Shri Sai Academy, Mhow.Emerald Heights International School, Indore won Best Aim and Utility Award while Best Question award from audience was won by RohitSatiya of Standard Public School. The winners were felicitated with the trophy and certificate. Students of Choithram School, Manik Bagh brought laurels to the school with their stupendous performance in 2nd National Students Exchange Programme held at Delhi Public School, Sagar from October 26 to 28, 2016. The school team comprising of Nutan Keswani and Disha Trivedi of class 12 along with Purva Bhardwaj, Chelsea Sawlani, Parv Birla and Prerak Murdia of class 11 competed with 12 leading schools of the country and bagged positions in eight events out of a total of nine events. The team secured first position in Exhibition on Child Stress and Best out of Waste Event, second position in Poster Making and Slogan Writing, Photography and Folk Dance and third position in Heritage Quiz, Collage Making and Street Play. School Principal Mr. Rajesh Awasthi congratulated the students for their outstanding performance. Choithram School once again emerged as a leading name in the field of sports when Disha Khandelwal of class VIII of Choithram School, Manik Bagh added a feather in the cap of the school with her exuberant performance by bagging silver medal in 100m and 400m track event in under 14 years girls’ category in CBSE State Level Athletic Cluster held at Army Public School, Gwalior from October 21 to October 24, 2016. Her performance has made her qualify for the Nationals to be held shortly. Mr. Rajesh Awasthi, Principal congratulated Disha Khandelwal for achieving this feat. ‘Creativity is not the finding of a thing, but making something out of it after it is found.’Choithram School, Manik Bagh hosted the Interschool Best Out of Waste event under the aegis of Sahodaya Schools Complex, Samagam 2016 on October 15, 2016 with 19 leading schools competing to exhibit their creativity in an aesthetic way. Ms. Anupma Jain, a renowned personality in the field of art and the Principal of Jain Academy was the Chief Guest of the day. The panel of judges included Ms. Swati Dravid and Ms. Nidhi Jain. The participants used waste materials coloured papers, old newspapers, cardboard boxes, plastic bottles, tins, old CDs, tyres, pins, toothpicks etc. to give wings to their imagination. Judgement was based on creativity, neatness, presentation, use of waste materials and utility of the product made. Best presentations were of Vidhyanjali International School, Standard Public School and Indus World School. The Chief Guest appreciated the imaginative work done by the creative minds. Vote of thanks was proposed by School Deputy Head Girl Aastha Vijaywargiya. Choithram School, ManikBagh celebrated Teachers’ Day on September 3, 2016 in a befitting manner. A cultural fiesta was organized to laud and revere the contribution of the teachers in building sustainable societies and helping in realizing the goal of quality education for all learners. Donning the role of teachers, class 12 students got the opportunity to experience the profession. Homage was paid to Dr. S. Radhakrishnan followed by the cultural programme. 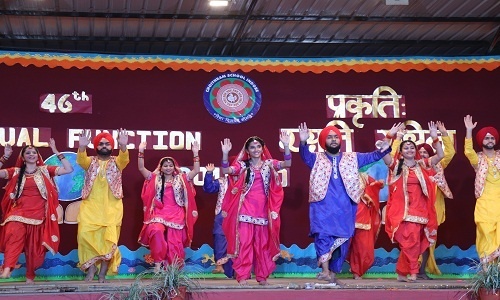 Students’ versatility was displayed through mesmerizing dance performances, melodious songs from the yesteryears, rocking band performance, remarkable mime performance and skit extending gratitude to the teachers for inculcating values. Compilation of memories, messages, love and respect in the form of a video made the teachers go down the memory lanes and relive the moments. The game show put the teachers on test. The teachers exhibited their sportive talent through a volleyball match where they equated the performance of the students. School Principal Mr. Rajesh Awasthi congratulated the teachers on the occasion emphasised the importance of teacher who can inspire, hope, ignite the imagination and instil a love of learning in the students. Best teachers were rewarded on the day. ‘Let the spirit of Independence prevail.’ The glorious red letter Day in the history of growing superpower, embodiment of peace and harmony, our motherland India was celebrated with patriotic fervour on August 15, 2016. The tricolor was unfurled by the senior most faculty Ms. Pallavi Sukhtankar, CCE Co-ordinator. The celebration was marked with the presence of volunteers of Rotary International, Brittaney Nicole Dawn and Eric from USA. An array of performances comprising of patriotic qawwali,melodious songs, dances and yoga display filled everyone with pride. The campus echoed with VandeMatram and Bharat Mata Ki Jai. AasthaVijayawargiya, Deputy Head Girl and Ms. Priya mvadaKanthed, faculty Junior School in their speech stressed on duties and responsibilities of citizens, making everyone ponder upon their negligence and how they could contribute their bit to sustain independence.The celebration ended with the rendition of National Anthem. Familiarization Meet for class 1 parents was conducted on June 8, 2016 to make the parents familiar with the system followed in the school. A brief introduction of teaching pedagogies was given to the parents. 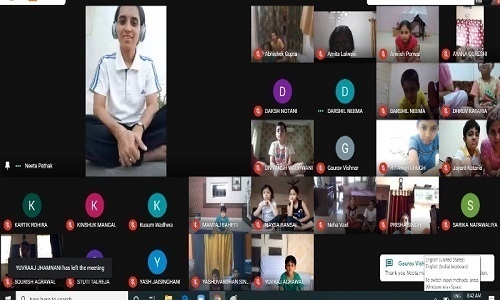 Activity based teaching learning, life skills, value based education, reading club, Spoken English Program, Parent’s Involvement Programme and teaching methodologies were explained in detail. To create awareness about the working and teaching methodology of the school ‘Familiarization Meet’ for Nursery parents was organized on June 7, 2016. The parents were briefed about the Montessori philosophy and the process of nurturing children in school. Graduation Ceremony was organized for Senior Montessori kids at Choithram School, Manik Bagh on April 7, 2016. The programme commenced with welcome dance presented by the students of Nursery and Junior Montessori. The students of Senior Montessori also performed enthralling dances on songs like ‘Gajanana’, ‘Tare Zameen Par’, ‘Rang de Basanti’ etc. Principal Mr. Rajesh Awasthi presided over the function. 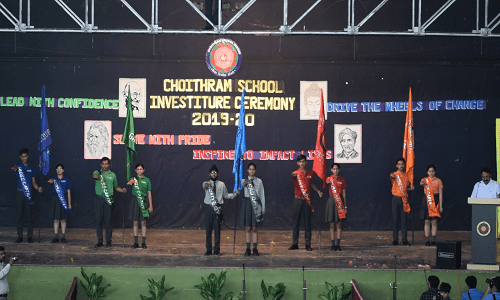 The whole ambience witnessed a combination of nostalgia, regalia and exhilaration when the students and staff of Choithram School gathered to bid adieu to the outgoing batch of class XII. The proud parents of class XII students who played a pivotal role in the ebullient journey of schooling years of their wards were the guests of honour on this momentous occasion. The programme commenced with the blessings of Almighty and proceeded with the cultural show comprising of dances, mime, skit, band performance and video clippings of the cherished memories of school time. Principal, Mr. Rajesh Awasthi in his inspiring speech urged the students to uphold the values of acceptance, courage and strength learnt in their schooling years. Mr. Nishit Dubey, father of Pratyush Dubey of class XII spoke about the role played by the school in shaping the personality of the child as well as strengthening of the parent-teacher-child relationship. 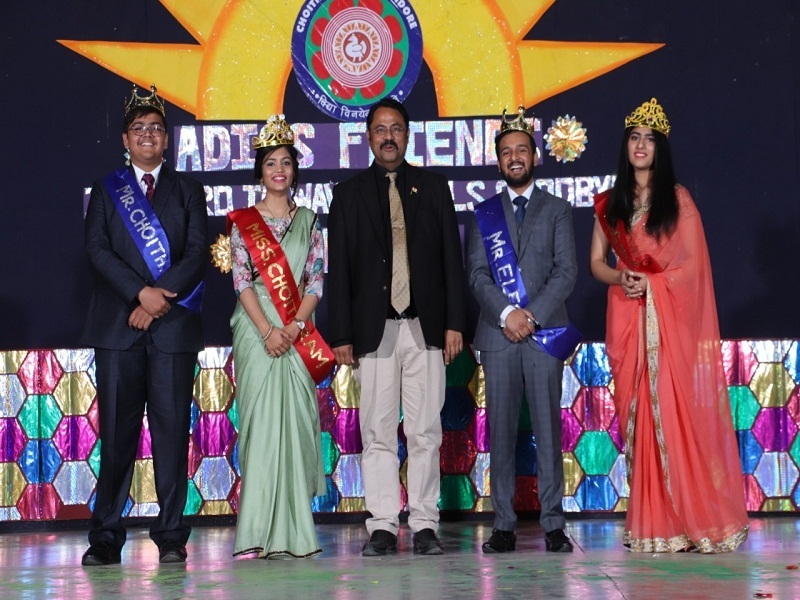 Mr. & Miss Choithram titles were bagged by Pratyush Dubey and Lovina Nimgaonkar while Pulkit Jain and Vandini Joshee received the titles of Mr. and Miss Elegant respectively. The 67th Republic Day of our country was observed with patriotic fervour in the school on January 26, 2016. The National Flag was unfurled by Ms. Uma Wadhawa, the senior most teacher of the school. The day made everyone feel proud of the rich cultural and social fabric of our country. The songs, dances and speeches pertaining to our Republic reminded us of the pain taken by our freedom fighters to free India and the framing of the constitution for its smooth working. Chelsea Sawlani of class X in her speech everyone realize that rights are enjoyed with the duties for the nation. Principal Mr. Rajesh Awasthi urged everyone to do small things with responsibility and automatically big things would fall in place. 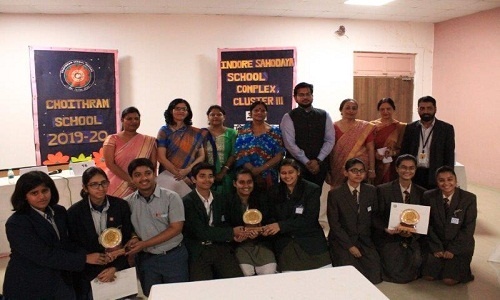 Choithram School hosted Inter School Legal Quiz and Parliamentary Debate Competition on November 6, 2015. It was organized by the School of Skills Educational Academy to commemorate Law Day and aimed at creating legal awareness among students. The event saw the participation of over 100 participants from around 18 schools of Indore and nearby areas. The topics dealt with current and social issues. The debate was conducted in Asian style (three against three). The adjudicators were Advocate Bahul Shastri and Advocate Khushboo Kewalani. The confident expression and in-depth knowledge of the students impressed everyone. 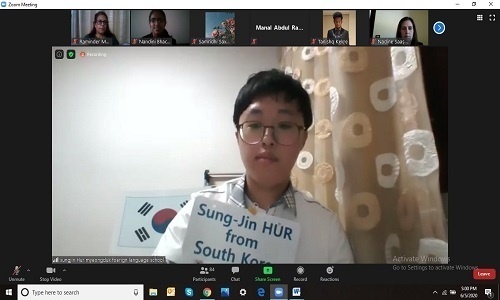 The teams of The Daly College and The Emerald Heights International School reached the finals and Daly College was declared the winner. The quiz comprised of a preliminary written round. Six teams reached the finals of the quiz. Choithram School team comprising of Himanshu Shukla and Ritika Ranka of class XII bagged the first position in the quiz. Justice Ramesh Garg, the chief guest for the valedictory function gave away the prizes to the winners and stressed on the importance of a fair and just judicial system. 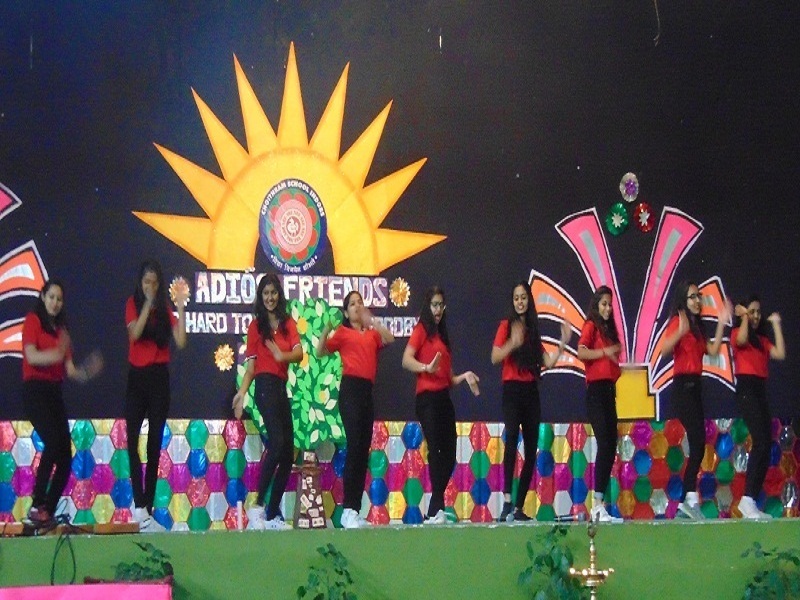 Children’s Day was celebrated as a grand fiesta on November 18, 2015 by the teachers of the Senior School. The day commemorated with immense joy, enthusiasm and magnificence with various activities and events specially organized to mark this day. The celebration began with the lighting of the lamp followed by a wide array of performances including informative skit, advertisement, instrumental performance, silent comedy show, mime, puppet show, folk dance and songs, inspirational videos and poem recitation. Through these performances teachers shared their most cherished desire for the well-being of children. While presenting the act, the teachers reflected the characteristics of children such as simplicity, purity of heart and mind, innocence and affection. The teachers of the Montessori section and Junior School arranged a programme for the students that included songs, comic skits and dances on classical and hit numbers. Students enjoyed and appreciated the performance of their teachers. 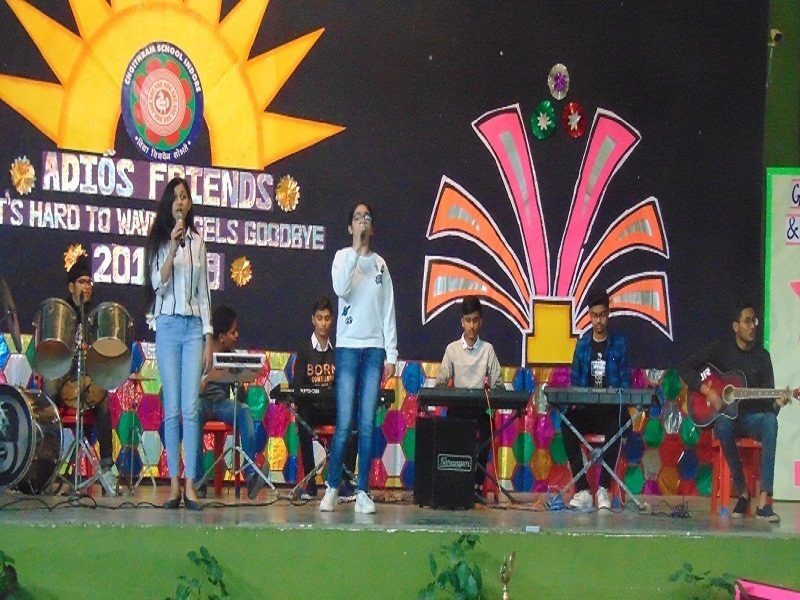 entertains and ultimately enlightens.’ To explore the creative ideas of the students, Inter School Ad Mad Competition was held under the aegis of Indore Sahodaya Schools Complex on September 30, 2015 at Choithram School, Manik Bagh. The topics for the competition were promoting slimming drink for obese, a magical locket and a deodorant. The event witnessed the participation of seven reputed schools of the city. The judges for the event were Mr. Prabuddh Dubey, Creative Director, Srijan advertising, Mr. Lalit Ingle, Lecturer, EMRC (DAVV) and Mr. Rajan Deshmukh, Artist and Guest Lecturer, EMRC (DAVV). Mr. U. K. Jha, Principal, Choithram School, North Campus was the Chief Guest. The humorous content added flavour to the creative spectacle. The rap, rhyme and jingle displayed the marketing skills of the students and fascinated the audience. The three best performances went to Queens’ College, St. Mary’s Convent Higher Secondary School, Mhow and Annie Besant School. The chief guest appreciated the outstanding performance of the students and shared his views on the intricacies of the advertisements. The programme ended with the vote of thanks by Aashana Mamtani, Member of School Council. Mr. Santosh Mishra, Vice Principal of the school received Patrika Teachers’ Excellence Award on September 18, 2015 from Oriental University, Indore. The jury of eminent educationists shortlisted 300 teachers nominated by the Principals of their schools on the basis of various criteria and bestowed awards to 30 teachers for their invaluable contribution in the field of education. ‘Nation building passes through teachers.’ September 5, 2015 serves as an opportunity to pay homage to teachers who toil to build the capacities of human resources for the socio-economic development of the country.To regard with reverential respect, Teachers’ Day was celebrated in Choithram School, ManikBagh on September 4, 2015. The day began with the morning assembly conducted by student teachers where they were given an opportunity to have an insight into the noble profession. In the addressalthe Principal emphasized that teachers can change lives with the right mix of chalk and challenges and advised the teachers to empower themselves by identifying the potential they possess. While the senior students of the school enjoyed the experience of teaching in the junior classes the Principal felicitated the best teachers from Montessori to Senior School. The cultural programme began with a stunning classical dance performance followed by the majestic euphony of band. The symphonious singing by the school’s nightingales filled the air with enthusiasm. 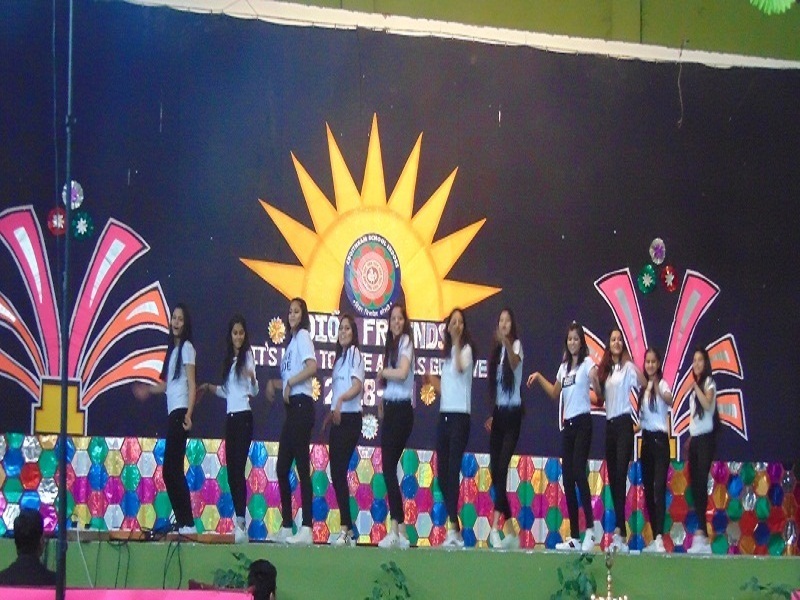 The stellar dance performances by the students won the admiration of one and all. The game shows rendered teachers an opportunity to prove their versatility. The most awaited visual treat was relished in the form of a video show where students captured the unforgettable moments with their mentors and portrayed the saga through a beautiful poem penned by Aditi Jain and SaniyaJeswani of class XII. ‘Flexibility within the brain and belief within the words are the essence of Independence.’ The entire campus echoed with patriotic zeal as the tricolour was unfurled by the senior most teacher Mr. SantoshMahale, HOD, Indoor CCA department. The feeling of oneness and pride was in the air. The inspirational speech AshanaMamtani of class X emphasized on the need to be an Indian every day of our life making everyone ponder upon their attitude towards our country. Mr. Harpreet Singh, Maths teacher Senior School while elucidating ‘Gender Sensitivity Pre and Post-Independence Era’ forced us to salute feminism. The programmeshowcased mellifluous song and dance presentationsrecharging patriotic fervour. The programme culminated with motivating thoughts by the School Principal who urged everyone to celebrate freedom by promoting a human rights culture in which respect, dignity and equality become a code for living. Choithramians proved their mettle by grabbing awards in ‘Reflection- International Youth Fest for History and Civics’ organized by City Montessori School, Lucknow from August 10 to 14, 2015. The school team comprising of Manas Jain and Purva Bharadwaj of class X along with and Mrs. Deepali Ahirao, faculty Social Science Department, Senior School won the second prize in ‘Endeavour: a project on Community Service’ where the students showcased the work done by the school students in rendering service to members of the community particularly with people less fortunate than themselves. Ms. Reshma Dave and Ms. Sandhya Arondekar are the Incharges of Community Service Club. The team comprising of Loveena Nimgaonkar, Rachit Raj Dangi, Disha Trivedi, Manas Jain, Sowmya Sukhtankar and Purva Bhardwaj bagged the second commendation award in ‘Kaliedoscope: Choreography over the theme Aim of life’. They were guided by Ms. Aditi Oswal, dance faculty of the school. The students competed with 63 schools from India, Nepal, Pakistan, Bangladesh and Sri Lanka.